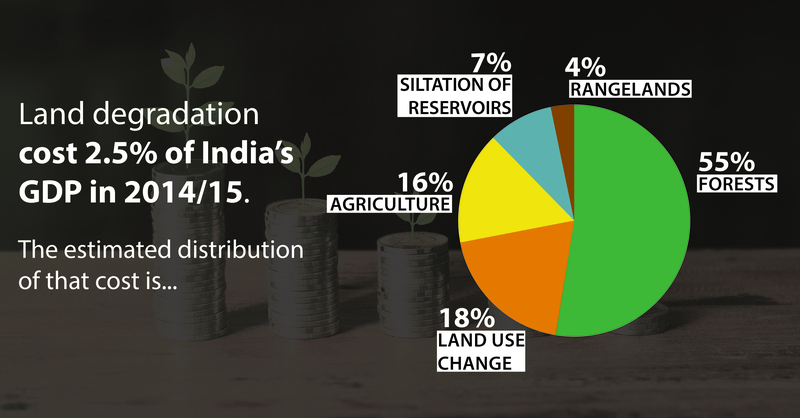 The cost of land degradation and land use change ate up to 2.54% of India's gross domestic product (GDP) in 2014-15, as per TERI's Study on Economics of Desertification, Land Degradation and Drought in India. Land degradation is evident across all terrestrial biomes and has far-reaching consequences. Following the range of services that land provides, its degradation can be direct (e.g. loss of agricultural productivity, wood and fodder production, tourism opportunities, ecosystem services, biodiversity, soil fertility, nutrients, carbon sequestration capacity and groundwater recharge) or indirect, including offsite costs (e.g. increased dust storms, changes in stream flow and reliability of irrigation, lowered drinking water quality). India aspires to be land degradation-neutral by 2030. If we consider the national target of 33% of India's area under forest cover (108479679 ha), then currently 20.79% of this target area either constitutes degraded forest (10.4% of GA) or is currently not under forests (34176179 ha or 10.4 % of GA). The infographics presents a broad picture of how India is affected by the degradation of this natural resource.